Fayston, Vermont is located in Washington County. Fayston is a Mad River Valley, town situated about midway between Stowe and Middlebury, Vermont. Chartered in 1782, Fayston has long been known as ‘bear country’, and the highest elevation of any Vermont town is found in Fayston’s ‘Highlands’. Situated just west of the Mad River and bordered to the north by Shephard Brook and to the south by Mill Brook, Fayston is an outstanding fishing vacation destination. The towns that comprise the Mad River Valley include Fayston, Warren, and Waitsfield – a year-round tourism center offering a multitude of outstanding lodging and dining venues, excellent skiing, hiking, hunting, and fishing. 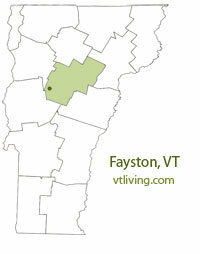 To share any Fayston, VT information, contact us. Learn more about advertising in VTLiving.